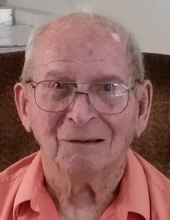 Vernon K. Olds, age 97, of Stevens Point, passed away on March 16, 2019 at the Portage County Health Care Center. Vernon was born on July 7, 1921 to the late Archie & Alma (Neuman) Olds in Junction City, WI. He attended the local schools. He married Virginia Dean on February 7, 1942 in Junction City. She preceded him in death in 1982. He married Lois Glass in Sebring, FL in 1983. Vernon worked on the CCC Camps in Eau Claire Dells and Rib Mountain. Following his marriage, he worked on various farms in the area including Jacklin Dairy. He worked at Consolidated Paper Mill in Whiting, WI and retired in 1983 after 37 years. Following retirement, he spent winters in Florida and summers in Wisconsin. He was an avid camper, traveled around the United States to various campgrounds. He almost made it to all 50 states. He was a lifelong active member of the Church of Christ. Vernon is survived by children, Kenneth (Alice) of Plover, Ronald (Linda) of Wisconsin Rapids, Wayne (Judy) of Plover, Gary (Mary Kosloski) of Stevens Point, and Terry (Barb) of Plover; grandchildren, Kerrie, Kellie, Julie, Nikki, Dean, Jason, Corey, Jenny, Chad, Trisha, and Jordan; 21 great-grandchildren; and 1 great-great grandson. He is also survived by wife, Lois and her 5 children and grandchildren; sister-in-laws, Iola Olds, Doris Brown, Clarisse Dean, Betty Dean Andringa and Donna Hedke. He was preceded in death by parents, Archie & Alma Olds; granddaughter, Krista; brothers, Arnold, Archie, Virgil, and Donald; and sisters, Hazel Brown and Bonita Wagner. Per Vernons request, a private graveside service will be held at a later date. To send flowers or a remembrance gift to the family of Vernon K. Olds, please visit our Tribute Store. "Email Address" would like to share the life celebration of Vernon K. Olds. Click on the "link" to go to share a favorite memory or leave a condolence message for the family.